The Enterprise discovers an exact duplicate of Earth, where the only survivors of a deadly man-made plague are some of the planet's impossibly old children. The episode was first broadcast October 27, 1966, and repeated June 29, 1967. It was written by Adrian Spies and directed by Vincent McEveety. This is the first episode to feature outdoor shooting after the first pilot "The Cage", featuring the redressed exterior sets from The Andy Griffith Show, which were located on the "40 Acres" backlot, property of Desilu studios at the time. 3 Other episodes filmed at the "40 Acres" sets are "The Return of the Archons" and "The City on the Edge of Forever". This episode introduced us to the first instance of "Identical Earth" which the writers of the show returned to throughout its run. It's one of those, "Don't think too hard about it," things and that philosophy is also probably best suited for much of this entire episode! A few things that struck me. While it was kind of odd for Kirk to spot the tricycle and excitedly call Spock over (because they were surrounded by Earth-like material), I definitely appreciated how McCoy handled it with care and reflection. Kirk putting on his best display of child predator on the show. Urgh. It was just creepy watching Kirk charm Mary from the get go to get her to help them, and the fact that it continued all the way to the end, until at the end of the show, there's the throwaway joke, "I don't date older women!" (Or something like that...) as if that's to excuse the behavior? It's really kind of cruel what Kirk does to her and it left a figurative taste in my mouth. I think the episode would have been more entertaining if it had run longer with the perspective of the children being nothing but bodiless taunts and songs connected to dangerous tricks and traps and then the occasional old child attacking them manically. Much of the info Mary conveyed probably could have been revealed through the discovery of notes or even a child's diary and drawings. Notably, Yeoman Rand with her amazing hair got to tag along with the exploration team. Though, it seems the only thing she really contributed was a stereotypical comment concerning her anxiety and fear at her beauty being compromised by the disease. This episode was not really kind to the female gender. Mary was given the chance to be brave, but it was only once she discovered she was infected. A great amount of tension was raised over the loss of the communicators and how they couldn't complete the vaccine/cure without the access to the ship's computers. 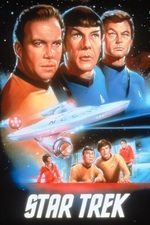 This lead entirely to a great scene of Kirk being beat up by a bunch of kids (one whom he kind of threw to the ground) and reasoning to them about their behavior and their situation, only for McCoy to experiment upon himself at the last minute and unsurprisingly, despite being rendered unconscious, having proved to have mixed up the right amount of serum. (Spock kind of shrugs off this decision by the writers with yet another throwaway comment about the nature of the medical mind). Of the episodes we've watched so far, I felt that this one was one of the weaker episodes. I suppose it offered commentary on the nature of adults and how perhaps children can be raised to avoid some of the problems that adults cause by following their worse feelings and tendencies. The central focus being the backward result of a search for immortality with a deadly plague felt kind of like a general sci-fi trope. The one good thing about this episode is that it, along with a couple other episodes lead to quite a bit of fan speculation about an alien race taking humans from Earth and seeding them on various planets around the galaxy. Of course if they could alter planets to resemble Earth, that would indicate a huge amount of power. This episode introduced us to the first instance of "Identical Earth" which the writers of the show returned to throughout its run. Well... sort of. They return to the concept, in a sense - they have Space Nazis and Space hippies and Space Romans and Space Indians and Space You-Name-It, but this is beyond that. I mean, look, there's Africa. Africa! Exactly! And (as far as I remember) they never go back to this planet or mention it again. But the thing that really bothers me about this is that they don't even go back to the concept past the first five minutes of the episode. It's just, "Oh, look, Africa, huh, how about that", and then the absolutely astounding fact that there's an almost exact duplicate of the earth is completely unmentioned from there on out. The "Parallel Worlds" concept makes production practical by permitting action-adventure science fiction at a practical budget figure via the use of available "earth" casting, sets, locations costuming and so on. As important (and perhaps even more so in many ways) the "Parallel Worlds" concept tends to keep even the most imaginative stories within the general audience's frame of reference through such recognizable and identifiable casting, sets and costuming." TNG's episode, The Chase, goes directly to the idea of an alien race seeding humanoid life forms throughout the galaxy. Why not another that picked up humans and deposited them? I think that'd be a fun theory to play out. I found the premise odd from the first five minutes. The crew brush off the fact that they have found AN EXACT copy of Earth way out in the middle of nowhere. Instead of studying that mystery, the writers move past it pretty quickly to keep the story moving. From a visual standpoint I thought the outdoor scenes were some of the best yet. The Enterprise sets all tend to look cheap (like the PVC pipes glued to a set wall) in the last few episodes. It was refreshing to see a set that did not look confined and fake. I still can't get over Shatner's acting. He managed to keep that same terrible intensity throughout his career, but it is way over the top. The other thing I noticed, was that McEveety stayed away from the extreme facial close ups we have seen in past episodes. There were a few singular shots but mush less dramatic. Jahn, the ''leader" of the onlies, is played by Michael J. Pollard. Jahn is supposed to be among the oldest of the onlies, and as the onset of the disease occurs at puberty, that makes the character the equivalent of -- what, 12 or 13? The same year (1966) Pollard played a similar J.D. role in an episde of Lost In Space, "The Magic Mirror" opposite 13 year old Penny Robinson (Angela Cartwright). This is also a story about "never growing up". Pollard was born in 1939, so he was 26 or 27 at the time of filming. Short in stature, for years he specialized in playing characters much younger than himself. The following year, he played (fictional) C.W. Moss in Arthur Penn's Bonny and Clyde -- a more age-appropriate, but still J.D. role. ...it seems the only thing [Yeoman Rand] really contributed was a stereotypical comment concerning her anxiety and fear at her beauty being compromised by the disease. She was also available for Kirk to hand the "hysterical" Miri off to for comforting -- instead of, you know a doctor. It's amazing that people fault TNG (or even the reboot movies) for not being good with women when this show is just constantly terrible on the sexism front. Yeah, while it's in no way excusable of latter day groans over Trek treatment of women (the Into Darkness - really?! ), it's kind of funny to think that Roddenberry's progressive push on female characters in TNG was a step up. Look, a female doctor! A woman in charge of security (until we kill her off!)! Also, a man wearing a skirt in the pilot which will never happen again! It definitely would have been interesting if Number One could have remained a woman, if only to have a woman in a significant leadership role on the Enterprise. Even this episode, we have a female doctor, but her presence is entirely to romantically tease Kirk and then parrot the main antagonist's lines about the safety of the ultimately evil device. To a degree, we can appreciate the improvements of later Trek, but one would have hoped that upon review of the original, those creating the new would be even more motivated to make up for these lapses. Incidentally, Bewitched came out in '64, which involved a female protagonist with incredible powers. Granted, her place in life was to be the best wife for her husband. I dream of Jeannie, came out in '65, and also provided a female protagonist with a lot of power, but even more so as a comedic character, and again, subservient to her man. Were there any shows in the '60s which really empowered women?